We’d love your help. Let us know what’s wrong with this preview of Day Is Done by Peter Yarrow. Caldecott Honor-winning artist Melissa Sweet has created gorgeous images that celebrate the loving bond between parent and child, as well as the connection between all creatures of the earth. To ask other readers questions about Day Is Done, please sign up. I'm a huge Peter, Paul & Mary fan, but my kids picked this one out from the library without me knowing what it was. My PP&M fan status, however, didn't help. The book is still crap. All will be well when the day is done." All will be well wh Are you kidding me? Works great for a song, but for a book? Shoot me now. I picked this up at Savers, complete with it's originally enclosed CD. It's really good. I do prefer the original Peter, Paul and Mary version of the song, however...Gotta re-buy that CD I used to have on vinyl! I wanted to like this more...but the story has a song within it. It threw me and if it wasn't so repetitive, it would've been better. I really like Melissa Sweet illustrations - especially of people. But this really wasn't a great song turned into book examples. Day is Done is a unique picture book/song/CD combo. Written by Peter Yarrow (of Peter, Paul, and Mary fame), the book illustrates Peter's song and a CD is included in the back with the song on it. This would be a great bed time story/lullaby for babies and toddlers. Nice message and decent illustrations but a lot of word/phrase repetition. I understand that repetition is beneficial but there is very little text and it becomes a bit boring as the caregiver doing the reading. Not much to this. I'm not sure the reason this was made into a book. I was not a huge fan of the repeating in this book. I understand that it is more of a lullaby type of song but I did not prefer that. I do however like the rhyming in the sentences. This board book is a version of the author's song, comforting young ones with the loving care and attention of their parents. Okay, so I have heard of the band Peter, Paul and Mary and I grew up in the 1970s listening to Puff, the Magic Dragon (and listening to a bunch of theories what it's really about), but that's about it for my knowledge of this group. When we saw this book at the library, we thought, "Aw, how cute - a nice story to read at bedtime." There is no story, just song lyrics to a song I didn't know. Song lyrics that repeated over and over in a seriously irritating way. I admitted to our girl Okay, so I have heard of the band Peter, Paul and Mary and I grew up in the 1970s listening to Puff, the Magic Dragon (and listening to a bunch of theories what it's really about), but that's about it for my knowledge of this group. When we saw this book at the library, we thought, "Aw, how cute - a nice story to read at bedtime." There is no story, just song lyrics to a song I didn't know. Song lyrics that repeated over and over in a seriously irritating way. I admitted to our girls after stumbling through this beast of a book that it probably would've sounded better if we'd just played the CD and followed along. So as I was getting ready to type this review (I just had to give it a fair chance), I popped the CD into my computer to check it out. I couldn't even listen to the whole song - it was quite irritating on its own! I guess I'm just too young? First I off I barely know the song that this book referenced and I did not get to listen to the CD that comes with the book. I was impressed with the art and the had the tune of the song in my head as I read it. It felt... I wouldn’t say depressing but very mellow...almost too mellow. Also this seems to be only for a son. As in the song or story “I will be here my son” is throughout the book. Nothing wrong with that I just thought Puff the Magic Dragon is more for every child or adult but a littl First I off I barely know the song that this book referenced and I did not get to listen to the CD that comes with the book. I was impressed with the art and the had the tune of the song in my head as I read it. It felt... I wouldn’t say depressing but very mellow...almost too mellow. Also this seems to be only for a son. As in the song or story “I will be here my son” is throughout the book. Nothing wrong with that I just thought Puff the Magic Dragon is more for every child or adult but a little hard to translate this song into book form for more then boys. I loved the art and the message but not the wording for a book. Maybe with the CD it stands out better. Author: Peter Yarrow. He co-wrote the song, "Puff, the Magic dragon." He is also an American signer with a folk- song trio. Review: A wonderfully sweet book based on caregivers and children's relationships. It is based on social-emotional because the caregiver always wants to know how the child is feeling. There is a lot of repetition and good vocabulary words. I have never heard about this book until my peer presented it at our storybook showcase. I love how his book can be used as a way to help/support the children when they are feeling the same exact way the cub did in the beginning. The illustrations were just incredible. They were a beautiful representation of what was going on in the story. I loved how my peer made rhyming words puzzle pieces to go along with the story. This was a really cute book! This is a book you could read during naptime to get the children to sleep. The book goes through different mom, and baby animals all going to sleep. It is a great book to read to children because you could ask what children do for night time, like there night time routine. 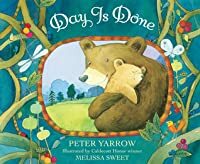 Day Is Done is beautifully illustrated and written with calming and peaceful words which can be wonderful bedtime story. This book will be great to read to children and create a discussion to help build social and emotional skills. The story have rhyming words. Day Is Done It could be also used to assist with creating communication, language and literacy skills. Day is Done is a poetic book about a father reassuring his son about his fears by being close to him. The children enjoy the repetition and the CD with two other songs that comes with it where the book is sung to music. The most outstanding part of the book is the illustrations by Melissa Sweet. This book is a great book for social emotional develop in young children. The story is very easy going and it has the touch of care for children. Wonderful to read at the beginning of the school year; so it can help children to feel safe.It has great vocabulary and rhyming words for Language Arts activities. Ages 3-7 yrs. This book can be use to help the children cope with separation anxiety and smooth them while feeling a strong emotion. It also can be use to teach to be grateful of so many things we have around. The text is very easy to follow and repetitive so it is great for beginner readers. Ages 3-7. This book is okay to read to children age one and above. It teaches love and comfort. This book also teaches a child that it is okay to go to school and when he/she come back home mom or dad will be there waiting for him/her. The pictures in this book was great. Maybe I needed the song to go along with the book but its a library book we checked out and if course there's no longer a cd with the book. It just wasn't enough of a story for my kids to get it, in fact they thought I was messing with them when I kept repeating the same lines over and over again. This book is great for mother and son book relationship. It has the social and emotional and also rhyming words. Is a relax book for bed time story. The presentation with this was good. Is a great book for early readers. If you're a fan of Peter, Paul and Mary and remember "It's Raining" with the lady bug and the house going on fire and the children burning? You're in the same (eerie) ballpark with this book (and snoozer of a CD). This book have great illustrations and I like the song. Is a nice book that have repetitive words and help the children is the area of social emotional area. This book is apropiate for young childrens. 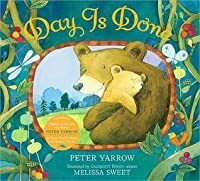 This delightfully illustrated book showcases Peter, Paul and Mary’s classic song: Day is Done. Featuring various animals and their babies the story moves through the song lyrics. A fun musical introduction to folk songs and an opportunity to sing to/with your child. Written by Peter Yarrow. This book will be able to put children's mind at ease and allow them to end the day. The text and illustration are good and children will love it.It promote social and emotional development.